Happy New Year (or close to it…). Hope your legion of followers continues to appreciate the outlet you give us to pick your brain, debate mythical matchups, and ridicule each other for picks gone wrong…. Event of the Year: Why do you believe that HBO leaving was named the event of the year over the WBSS? I do understand 45 years is a long time, but they had put boxing on the backburner for sometime. The WBSS provided the format to crown WORLD champions (rather than beltholders), and without the WBSS, Usyk would not have had the opportunity to achieve what he accomplished. 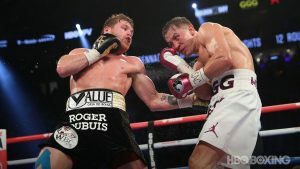 Fight of the Year: GGG-Canelo was a very good fight, but I have a hard time voting for a FOTY that didn’t have real drama (at least one knockdown) or some pillar-to-post beatings where one of the fighters appears on the verge of collapse before mounting a comeback. My choice, not because of nonstop sustained action, would be Ortiz-Wilder. The first 4 rounds sucked. Yes. But the knockdowns that followed, the fortitude that both men showed fighting through the storm, and the beautiful, non-controversial ending, provided a storybook fight that you can show to friends and not feel a sense of letdown. Fighter of the Year: I am going out on a limb and guessing that the deciding factor was activity? I would have named Usyk… but in retrospect, were his wins over better P4P fighters than Linares or Pedraza? Especially in light of Loma fighting with a torn labrum vs Linares? Or even Parker and Povetkin? Not a category, but which fighter do you think had the ‘best’ win of 2018? Meaning clear win over the fighter highest up the p4p ladder. For example, Tarver kayoing RJJ, SRR toppling Chocolotito. I think Hurd beating Lara or Gvozdyk defeating Stevenson, although Alvarez knocking out Kovalev is surely in the conversation. For whatever my two cents are worth. Thanks for allowing me to help you slack off at work. My choice for ‘Best Win of 2018’ is Vasiliy Lomachenko’s 10th-round stoppage of Jorge Linares. He was the challenger (vs. a Ring champ), he was the smaller man (in his first lightweight bout), he was in with an experienced elite-level boxer, he had to deal with an injury and getting knocked down for the first time as a pro, and he dug down deep to score a TKO (off a body attack) in a fight that was up for grabs on the scorecards at the time of the stoppage. Event of the Year – While the World Boxing Super Series definitely has had a positive impact on the sport, the bigger “story” in our opinion was HBO’s decision to leave boxing, a move that went beyond positive or negative; it was indicative of a paradigm shift (sorry for the college-boy terminology) within the industry, or to put it another way, it was the final “event” that helped usher in a brand new era with major changes to the landscapes of the business and boxing broadcasting. Elite fighters and world-class fights that once automatically landed on HBO are now up for grabs in an open market that is split between three key platform-promoter partnerships: Top Rank/ESPN/ESPN+, the PBC/Showtime/Fox and Golden Boy/Matchroom/DAZN. rounds? (YES!). The fight didn’t have any knockdowns or fighters on the verge of being stopped or overwhelmed because it was high-level battle between elite boxers who happen to have world-class whiskers. 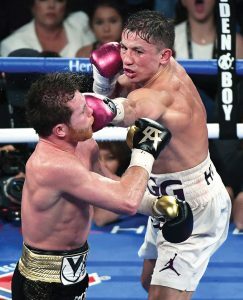 However, it was fast-paced and physical because Canelo and GGG know defend themselves without detracting from their offense. We witnessed expert mid-range and infighting from these middleweights and every round was close. It was the closest performance I’ve seen to the classic first bout between Mike McCallum and James Toney. I enjoyed Wilder-Ortiz, but the defending WBC heavyweight titleholder (who I love to watch fight) looked like he started boxing last year, and poor King Kong looked his age (his REAL age). Fighter of the Year – Activity was just one factor in the Ratings Panel’s pick of Aleksandr Usyk, accomplishments, quality of opposition, overall dominance and the challenges he faced by fighting in the home regions of his opponents were all factors. Yeah, he fought three times, more than most elite boxers did in 2018, but he also unified the four major titles in his division by beating the other top two cruiserweights (outpointing highly regarded Murat Gassiev in dominant fashion for all the marbles in the WBSS final), and he defended the undisputed/Ring championship against a credible challenger. I don’t think Usyk’s opponents were as highly regarded as Linares or as experienced as Povetkin (I do view them as good or better than Parker and Pedraza), but they were legit threats, and Gassiev, at the time Usyk fought him, was probably viewed as one of the most dangerous men in boxing. I want to get your opinion on two topics. Normally there is not much arguing with the year-end-awards from my side but I cannot at all understand how Sho Kimura vs Kosei Tanaka was not even nominated for fight of the year. 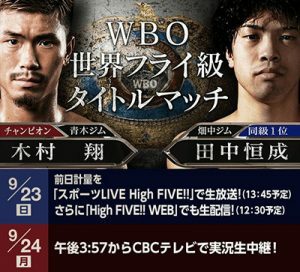 I was kind of pumped up for the fight after reading the article from Masa Ueda on ringtv.com (https://www.ringtv.com/544105-sho-kimuras-rocky-story-continues-against-wunderkind-kosei-tanaka/) and really impressed after watching the replay the next day. What a fight, what a story. Constant drama and action and after 12 rounds I was wondering how these guys could still stand. If these were two Mexicans in StubHub, I believe there would be no discussion, at least about a FOTY-nomination. What’s your take on this underappreciated fight? How do you think Mikey Garcia would do against the other top 10 welterweights besides Errol Spence? Thanks for the kind words and New Year’s wishes, Maui. It’s hard to say how Garcia would fare against any top-10 welterweight before seeing him fight at 147 pounds. Based on what I’ve seen of him at 140 pounds (his bouts with Adrien Broner and Sergey Lipinets), I think he’ll give any welterweight trouble if that welterweight allows him to set the pace and doesn’t at least try to dictate the jab. Lipinets matched Garcia’s jab and fought an aggressive-but-smart fight, which made master technician look vulnerable. We’ll see what Spence can do. And we’ll see what Garcia can do against Spence. If he can hold his own against the No. 1-rated welterweight, it suggests that he would do well against any top 147 pounder but we should keep in mind that styles make fights. Someone like Keith Thurman, who is fast and can punch (hard) on the fly, could be all wrong for Mikey. Regarding my thoughts on Kimura-Tanaka, you said it all by calling it “unappreciated.” Kimura was under the radar (even in Japan) and Tanaka, who has won world titles in three weight classes in just 12 pro bouts (by the age of 23! ), is the definition of unappreciated (either that or fans just don’t care about the WBO belts). Just so you know, and feel free to check this with members of our Ratings Panel on social media, Kimura-Tanaka was on the short list of Fight-of-the-Year candidates from the time it happened until about early December when we had to pair it down from eight or nine to just five bouts. Kimura-Tanaka was cut (along with Wilder-Fury, Wilder-Ortiz, Chisora-Takam, Taylor-Postol, Valdez-Quigg, and a few others). Would that have happened had Kimura-Tanaka taken place in the U.S. and televised on a major boxing-friendly network like ESPN, HBO or Showtime? Probably not. Would that have happened if Kimura and Tanaka were North Americans instead Japanese? Maybe not. Would that have happened if they were welterweights and not flyweights? Definitely not. But it is what it is. Fights that take place overseas, off-U.S. TV/platforms, in the sub-featherweight divisions have three strikes against them no matter how damn good (or even great) they turn out to be. At least that’s the way it used to be. I think attitudes are (finally) beginning to change among fans and media and hopefully in future years, we don’t have “underappreciated” (or overlooked) fights as good as Kimura-Tanaka. I hope you have had a peaceful Christmas with your family and I wish you all the best for 2019. I enjoy your mailbox a lot and want to thank you for your comments. I catch myself thinking “how would Mr. Fischer comment on particular occasions?” Please take this as a compliment. This year I only did see boxing live once. It was the magical night at the MSG when Lomachenko fought Linares. If I had only one opportunity to watch an event in 2019 and if I could pick any (realistic or not): What would you recommend? Thanks for the kind words and wishes, Matthias. Should I have T-shirts made that state “What would Dougie do?” or would that be considered blasphemous? Anywho, one opportunity to watch a live boxing event in 2019 (realistic or not)? I have to assume that you’d be stoked to be ringside for Anthony Joshua vs. either lineal champ Tyson Fury or WBC titleholder Deontay Wilder for the vacant Ring magazine heavyweight championship of the world. Whether that fight took place in the U.K. or the U.S., it would be MASSIVE (as the Brits love to say). If AJ vs. one of the other Big Three doesn’t happen, we’ll definitely be treated to Wilder-Fury II and I think that rematch is among the hottest tickets of 2019. High on my list are the WBSS bantamweight and junior welterweight tournament finals, and hopefully (fingers crossed) some kind of title-unification combination involving the four major light heavyweight beltholders. Not hating on Canelo but honestly, how can he be Fighter of the Year? Fought twice. Once after a failed PED test against aging GGG. Like you saw, and you reteweeted, 95% of the press and writers saw it a draw or a GGG win. He then fights Rocky (no disrespect but come on, there are 7 JMW, 10 MW and 10 SMW who beat him clearly if they were to fight) for a “regular” title. How come can he be Fighter if the Year with a bad win and a controversial draw-lossish? All politics aside Dougie. No WBC, no money, no The Ring talk. You. What do YOU think? Crazy we mention him near Uzyk. Nobody was “near” Aleksandr Usyk in terms of Fighter of the Year in 2018, and nobody (including those on The Ring’s Ratings Panel and Editorial Board) ever suggested so. All politics aside, I thought the Boxing Twitter backlash against Alvarez being one of FIVE candidates (mostly from overzealous GGGroupies) was ridiculous. You guys get way too worked up over Canelo. Personally, despite all of his problems, scandals and setbacks, I had no problem with Canelo being a candidate. Never mind the Fielding fight, he accomplished enough with the Gennady Golovkin rematch to have a place alongside Vasyl Lomachenko, Naoya Inoue and Tyson Fury as a 2018 FOTY “runner-up.” He fought Golovkin in an aggressive manner that very few middleweights have dared and was successful at it, enough for the fight to be legitimately close and up for grabs after 12 hotly contested rounds. I sscored it a draw, and like almost everybody, I acknowledged that there was more than one round that could have gone either way, so I’m not going to categorize the fight as a bad decision. It’s fair to call it controversial or “disputed,” and it’s fiercely disputed and debated within the diehard boxing space because of the dedicated supporters of each star, but it’s not like the first fight or the sort of situation where the “wrong guy won.” There are people on the Ratings Panel whose boxing knowledge I respect that scored the fight 115-113 for Alvarez. 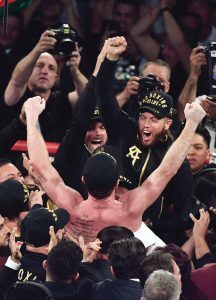 Canelo won the official decision by reasonable scores and with that verdict he regained The Ring and WBC titles, won the WBA belt and retained his lineal champ status. He’s also the first man to beat Golovkin (whether you agree with the decision or not – and I know it burns GGG’s legion of fans) – the sport’s longest reigning champ and The Ring’s Pound-for-Pound king – in the pro ranks. That’s a big deal. Last weekend’s doubleheader featuring the Charlo brothers got me thinking about siblings that have been successful as boxers. The Spinks, Klitschko, Ruelas and Marquez brothers came to mind. I can certainly see a case made for all the fighters in this group to be in the HOF. Who out of all of them would you consider to get in? Who do you think is the best brother duo ever? I think Rafael Marquez had a pretty good run and was a fearsome puncher for a while. His KOs of Tim Austin and Mark Johnson were big back to back wins that are as good as any win in this list. I would definitely vote for him. Is he eligible? I think he has as good a resume as any of the guys that guys elected this year. Rafael Marquez’s last fight was in September 2013 (a KO loss to Efrain Esquivias – I did the international broadcast with Alan Massengale), so he’s now officially eligible for the IBHOF (a fighter has to be retired for five years in order to get on the ballot). I think he’s worthy. Not only does he have a hall of famer (2-Sharp) and an excellent Olympic medalist/pro titleholder (Austin) on his ledger, he’s also part of a great multi-fight series with Israel Vazquez, which resulted in back-to-back Fight of the Year awards (2007 and 2008). His brother is definitely getting in. I’m not sure who the best boxing brother duo of all time are, but the best I’ve seen live are the Marquez brothers, with the Klitschkos coming in as a close second. Vitali was just inducted and Wladimir, who is far more accomplished than Big Bro, is a lock. Last weekend’s doubleheader featuring the Charlo brothers got me thinking about siblings that have been successful as boxers. The Spinks, Klitschko, Ruelas and Marquez brothers came to mind. I can certainly see a case made for all the fighters in this group to be in the HOF. Like I noted, Vitali is already in. Michael Spinks has been in the IBHOF since 1994. Donald Curry, the former undisputed welterweight champ, will be inducted next summer. His brother Bruce, a junior welterweight contender during the late 1970s/early ‘80s, was not as talented or accomplished but Bruce Curry won the WBC 140-pound belt and gave a hall of famer fits in two 10-round fights – the great Wilfred Benitez. The first Benitez-Curry bout was a controversial split decision loss for the Texan (he scored three knockdowns but got screwed due to New York still being on the rounds scoring system instead of the 10-point must system). Curry also beat solid contenders, such as Ronnie Shields (now a noted trainer), Leroy Haley (twice) and Tyrone Rackley. Other boxing brother duos where one bro is in the hall of fame include the Norris brothers (Terry’s in; Orlin, a former cruiserweight titleholder and heavyweight contender, is not) and the Galaxy twins (Khaosi is in; twin Khaokor won the WBA bantamweight title by upsetting borderline hall of famer Wilfred Vazquez). Who out of all of them would you consider to get in? The Klitschkos and the Marquez brothers. By the way, I saw Rafael at an ESPN show in Cancun this past summer (even shared a ride to the airport with him and one of the boxers he now manages and who fought on the card) and he looks and sounds great. What’s up Doug? hope you’re well and had a good Christmas! I don’t know if you remember but I wrote to the mailbag asking what was missing from Tony Harrison after his fight with Hurd and you leaned slightly and rightly towards stamina more so than a bad chin. He said he fixed them issues and I think he showed it Saturday. Although I envisioned another late stoppage loss I think Charlo let him fight at his pace and Harrison picked off good shots…especially the jab which carried the fight and was non-existent for Charlo as he loaded up too much, same as the Trout fight. Maybe he fell too in love with his power? I scored it 7-5 or even 8-4 for Harrison. Am I wrong? How did you score it? I know you’ll call it how you see it. Also, I think Jermall’s assessment of his fight was spot on…it was a good learning experience, he won, but with a 119-108 margin? Hope Korobov gets another big fight out of that effort. One thing I think Charlo would need to tighten up is his defence. He got tagged often and if he gets that mandated shot against Triple G you don’t wanna be eating them shots…who wins if they fight next? Thank you, David. You’re too kind. If Golovkin were to fight Jermall Charlo next, I’d heavily favor the former champ and Olympic silver medalist to out-jab and outbox the intense contender from Houston over the 12-round distance. I think it would be competitive and entertaining, but I don’t think GGG even needs power to outclass Charlo. His jab, defense and ring generalship should be enough to outpoint the keyed-up boxer-puncher. I scored it 7-5 or even 8-4 for Harrison. Am I wrong? I don’t know. I don’t think so. I still haven’t scored the fight for myself, so I really can’t say for sure. But as I noted in Friday’s mailbag, I watched a replay of the fight (with Spanish commentary that I barely paid attention to) after taking a two-hour nap (following a drive from Los Angeles to Mesa, Arizona). I watched it on my laptop while lounging on the Airbnb sofa, Guinness beer in hand. After 12 rounds, I didn’t think a Harrison win was out of the question. Also, I think Jermall’s assessment of his fight was spot on…it was a good learning experience, he won, but with a 119-108 margin? Hell no! I’m good with the Charlo victory by 115-113 or 116-112 score, but no more than that. And, yeah, I agree it was a learning experience for him. Hope Korobov gets another big fight out of that effort. Me too. I think he’s worthy of a shot at Rob Brant or Demetrius Andrade. One thing I think Charlo would need to tighten up is his defence. Agreed. Beyond that he (and his brother) just need to fight more often and relax more in the ring. Hey, hey, Mr Fischer how are you. To repeat the usual. Your bag is the best thing to read on the market! Charlo brothers: Man, these guys are good. And Dougie I say good cuz that’s how I feel so far. I don’t feel they are great fighters yet. Jarret Hurd at 154 is the most accomplished with his knockouts over Trout and great but close win over Lara. And I definitely think he would outwork and beat Charlo when they meet. Especially after Harrison beat him. I still wanna see the fight. What do you think? The 160-pound Charlo is good, but he isn’t ready for the elite just yet. GGG, Jacobs, and Canelo would punish this man. You agree? I just don’t think he has the total package. He’s missing that secret ingredient you can’t just put your finger on. Lennon gives Buffer a boxing lesson but compassionately holds back from inflicting any serious damage, and, of course, is classy as always before, during and after the bout. Ward by majority decision in a fight most observers believe the American won clearly. Martinez outjabs, outworks and outmaneuvers Mayweather to a competitive but clear decision that shouldn’t be as close as the official scorecards would have it. Charlo brothers: Man, these guys are good. And Dougie I say good cuz that’s how I feel so far. I don’t feel they are great fighters yet. Far from, but that’s true for every active fighter in the game. Jarret Hurd at 154 is the most accomplished with his knockouts over trout and great but close win over Lara. I think most of us can agree with that. And I definitely think he would outwork and beat Charlo when they meet. Especially after Harrison beat him. I’m not so sure about that. Styles make fights. I think Hurd’s aggression and pressure suit Jermell a heck of a lot better than the “cutie” style Harrison displayed last Saturday. It’s a terrific matchup if and when it happens. As much as I enjoy watching Hurd fight, I might lean toward Charlo. The 160-pound Charlo is good, but he isn’t ready for the elite just yet. I agree. GGG, Jacobs, and Canelo would punish this man. You agree? I would favor all three to win, but I don’t see them beating the crap out of Jermall, no. He’s too dangerous for them to employ seek-and-destroy tactics. And they’re too smart and experienced not to respect him. Of the three, I think Canelo, due to his slip-and-counter style and his body punching skills, would probably inflict the most damage of the three top middleweights. I see GGG outjabbing and outworking Charlo, and Jacobs outmaneuvering the Texan with stick-and-move tactics. I just don’t think he has the total package. He’s missing that secret ingredient you can’t just put your finger on. I’m not sure I agree with you. I don’t think any of the top middleweights are the “total package.” All Charlo lacks in my opinion is activity and experience against top opposition.